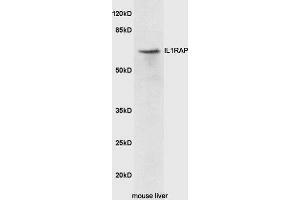 Mouse liver lysates probed with Rabbit Anti-IL1RAP Polyclonal Antibody, Unconjugated (ABIN2176996) at 1:300 overnight at 4 °C. Followed by conjugation to secondary antibody at 1:5000 for 90 min at 37 °C. Coreceptor for IL1RL2 in the IL-36 signaling system (By similarity). Coreceptor with IL1R1 in the IL-1 signaling system. Associates with IL1R1 bound to IL1B to form the high affinity interleukin-1 receptor complex which mediates interleukin-1-dependent activation of NF-kappa-B and other pathways. Signaling involves the recruitment of adapter molecules such as TOLLIP, MYD88, and IRAK1 or IRAK2 via the respective TIR domains of the receptor/coreceptor subunits. Recruits TOLLIP to the signaling complex. Does not bind to interleukin-1 alone, binding of IL1RN to IL1R1, prevents its association with IL1R1 to form a signaling complex. The cellular response is modulated through a non-signaling association with the membrane IL1R2 decoy receptor. Secreted forms (isoforms 2 and 3) associate with secreted ligand-bound IL1R2 and increase the affinity of secreted IL1R2 for IL1B, this complex formation may be the dominant mechanism for neutralization of IL1B by secreted/soluble receptors.